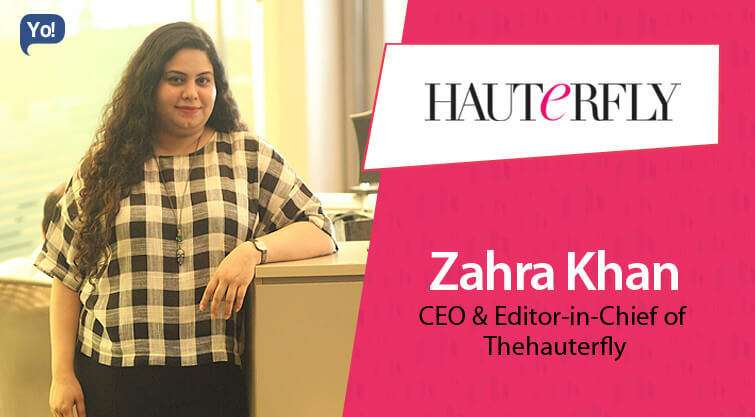 A stickler for perfection, Zahra has always had an eye for the latest fashion and lifestyle trends, great content and eye-catching imagery. She is extremely dedicated and has a hawk’s eye for the smallest details. After completing bachelors of commerce in banking and finance, she started her journey as a copy editor/features writer for Pune times. She gradually moved up the ladder in the journalism arena gaining ample credence. Over time working in the lifestyle sector, she started to ponder upon the idea of launching her own media company. Hauterfly was conceptualized and brought to reality soon after and rest is just history. Within a span of few months, it has created a huge buzz around itself. A next generation media company influences how urban Indian women spend their time and money. Through our premium and shoppable content, we help women discover what is hot, new and happening in fashion, beauty, home décor, tech and lifestyle. Hauterfly is a next generation media company curating the best in Fashion, Beauty, Décor, Tech and Lifestyle for millennial Indian women. The idea germinated from a lack of well written, well-curated, and visually inspiring independent websites focused on personal style and shopping in India. Our aim is to provide daily inspiration on the coolest and newest destinations and products to shop online, via trend-led and celebrity-led editorial stories for the affluent and influential digital native. I come from an editorial background, having worked with some of the biggest names in national media including The Times of India, Times Now, and HELLO! Magazine – among several other media outlets – for nearly 15 years. Therefore, while I have the perfect skills and experience to ideate for and create quality content, that would appeal to a cross-section of women; I do not have the business experience to complement it. However, having worked for a fashion e-commerce startup for nearly two years before launching Hauterfly, I got some great exposure on how things work, what needs to be done, how to prioritise, hustle and get stuff done! While Hauterfly is definitely a passion project for me, the biggest challenge is turning it into a viable business for the long term. I’m grateful I have a very supportive partner at my incubator, run by a young and ambitious CEO who is always pushing me to put on my business hat along with my creative hat and constantly think about doing only what’s best for the brand we’re building. Hauterfly is an independent website that influences how urban Indian women spend their time and money online. Through our premium and shoppable content, we help women discover what is new, hot and happening in fashion, beauty and lifestyle across the country. Designed to wow both readers and shoppers, our “content first” approach gives us an expert editorial voice, inspiring fashionistas via addictive fashion content, highly curated product discovery and insider tips from celebrities, tastemakers and experts, making us a trusted resource for informational fashion content online. As a daily destination dedicated to style and shopping, our purpose is to inspire personal style and drive women to discover and shop brands they will love, making us the ultimate source for impeccable style and shopping advice in the country. Be the best at what you do. Always aspire to and hold yourself to a higher standard and constantly work at reaching — then bettering — it. Fork Media — a leading digital ad tech company — are currently incubating us and details on the investment are confidential. We have only been in the market for a little over three months, and I have already had two people quit for personal reasons. This is not to say that I am a taskmaster – which I am! – But I think it is important to surround you with doers and thinkers, and hire people who are ambitious, passionate about their work and thrive in chaos. A startup environment is very tough and extremely demanding of your time and head space, so it is important to hire people who enjoy challenging themselves and proving their worth, versus people who will treat this as “just another job”. Invest in people who are equally invested in your brand. Passion for your product, a clear vision for how you see it today and how you want it to evolve in the future, and sheer determination to succeed even when things are not in your favor. I use this amazing app called CoSchedule that is an editorial calendar + social media scheduler rolled into one. It lets me plan my content a week or a month in advance and simultaneously promote it on social media today, tomorrow or a month later. Just schedule and forget about it. It is brilliant! I also use Evernote to organize my thoughts and ideas, save clips of web pages I like or would like to read for later, or collaborate with my team so that we are all on the same page. Making a daily “To Do” list and checking things off as I go about my day. I think this daily habit is important because it allows you to approach and prioritize your work in a more structured manner and manage your time better. In addition, there is a great sense of satisfaction in marking something as “done” every single day. I used to create To Do lists in a pretty notebook earlier, but now I just create digital sticky notes on my desktop using the Stickies app. They are the first things I see as soon as I open my laptop every morning, so there is no way for me to escape them! Reading late into the night, and not allowing my brain to process the events of the day or even give it some rest. I am a Type A personality so it is hard for me to switch off. Ideas and inspiration are everywhere, so it is a constant battle trying to get my brain to stop thinking constantly about things I can do! Ask for help when you do not know something. There is no shame in that. Not everyone can know everything. Don’t procrastinate. Learn to prioritize and manage your time well. Believe in your experience and always trust your instincts. To grow Hauterfly into a leading digital destination for fashion forward Indian women. We are focused on engaging millennials in a meaningful way by giving them relevant, fun and useful style, beauty, and shopping advice. We want to simplify their shopping experience by shortening the path from inspiration to transaction via rich, trend-led editorial content. As an independent, digital-first media startup, we are setting the standard for premium content online. What’s more, our audience connects with content in a way that is very meaningful for brands, leading users from an editorial experience to a shoppable one. I believe we are designing a formidable media brand with this venture and are poised to become a vital destination for brands looking to engage with millennial Indian women. Goa, Goa, Goa! It is my happy place. I love being by the ocean with salt in my hair and sand in my toes. I do not think I would change a thing. Every experience has led me to the place I am in right now, and I could not be more grateful. I would, however, probably learn the business side of publishing better!